The miscalculation: In less fertile and plowable areas such as the steppes and prairies of Africa and North America animal husbandry can also be used to produce food where agriculture is not or hardly possible: The cattle eats the grass, which otherwise would not be useful to human nutrition. With a purely vegetarian diet, these areas could therefor no longer be populated. Are steppe areas ideal for "meat production"? On the contrary, meat production in steppe areas makes the situation worse and is not sustainable. At first sight, the assumption seems logical: planting vegetables in a steppe will not be very successful. In a holistic approach, however, the situation is quite different: How does the continual expansion of the steppe regions occur? A steppe arises when the groundwater level drops more and more and the larger plant vegetation disappears. The main reason for this is the meat production, because it requires a lot of water and forests or single trees and shrubs, which are important for the water balance of each region, backs. For example: To produce one kilogram of grain about 100 liters of water are needed; for a kilogram of beef about 5000 liters (depending on the production method, the water consumption can even be a multiple of this). But this ratio of 1:50 shows that meat production, especially in arid areas, can not be a good way of dealing with the land. 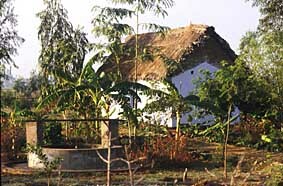 Afforestation with (fruit-) trees is a tedious affair, but brings the ecological balance in order in the long term and then alows a healthy vegetarian diet again. Some development aid organizations have already recognized this. Instead of digging deeper and deeper wells for the drinking water of the so-called "slaughter animals", it makes more sense to ensure that the groundwater does not continue to fall by caring for the environment. Grass and pastureland can store very little water, allowing the soil to dry out much faster than in shrubs and trees. Meat production in steppe areas thus worsense the situation and is anything but sustainable. Mango and walnut trees instead of dry steppe landscape. 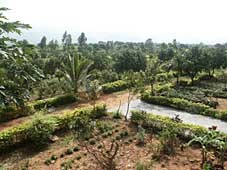 In this Swiss-initiated project in a poorer region in southern India (in Arai of the Chitoor district of Andhra-Pradesh), it was hard to imagine at the beginning that a thriving, green landscape could ever develop here. 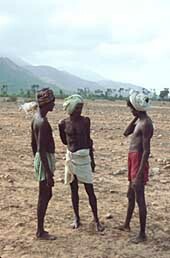 The barren, dry, stony landscape was used at most for some goats. To get enough food for the goats, branches were cut from the trees so that the goats could reach the leaves. The sparse last trees were felled because of their wood, so that they could be sold in the city. This not only made the country poorer, but also the inhabitants of the whole region. The drought was able to spread more and more. After more than ten years, however, you will find vegetation in this once inhospitable area, which not only positively influences the local climate, but also allowed many free-living animals to settle in the area. This "miracle" was accomplished by switching to a vegetarian use of the area. Trees were planted, which not only donated shade and positively influenced the climate, but also opened up new economic opportunities for the area through their fruits (especially mangos and cashews). With the trees the ecological balance could be restored. The pictures show clearly how nature can recover when you focus on a sustainable, plant-based, vegetarian diet. That's none of my business? India is far away and there is enough water in Switzerland. Nevertheless, our diet in Switzerland has a connection with the spread of the steppes abroad. One connection is that the rich industrial nations have a model effect on poorer countries. Today, most people who eat no meat can not do so for economic reasons (along with the religiously based vegetarian diet). However, as soon as these people have enough money, they will try to acquire what was previously reserved for the richer sections of the population. If the Swiss population, which is known to be very wealthy abroad, would largely dispense with meat consumption, even though it could afford it, this would be a sign that wealth and meat consumption are not necessarily related. The meat would be attacked in his reputation as a status symbol. A high meat consumption would therefore not be so desirable for people who (still) can not rarely afford. In today's situation with the highest meat consumption in developed countries, it is completely unbelievable to say to poorer countries that high meat consumption is not desirable. This is a big global problem: If one day all the Chinese would eat as much meat as the industrialized countries do today, the entire global grain harvest would not be enough to provide China with enough meat. It is therefore urgent to stop this trend immediately, as long as not all rainforests and other areas for meat or feed production have been converted to steppes. And more than all the arguments the own role model counts. In 2002, 9.5 million birds were imported. These are fed almost exclusively with concentrates (cereals / legumes). Switzerland imported more than 140,000 tonnes of meat in 2002. But even with the meat that is "produced" in Switzerland, there is an indirect connection with animal feed production abroad. The Swiss meat production would be impossible today, if it were not imported from abroad. The weakness has also been noticed by the meat industry several years ago. This is why today animal feeds are increasingly being produced in Switzerland. The extent to which this lobby was successful shows that, even in 1994, subsidies for bread grain were lifted unilaterally, while the subsidies for feed crops remained. As a result: even more bread grain and other plant-based foods have to be imported into Switzerland, as the agricultural land is now increasingly used for animal feed. In 2002, Switzerland imported approximately 700,000 tonnes of feed. Increasing trend: In 2012 there were already over 1 million tons! In 2002, 300,000 tonnes of wheat were imported into Switzerland, as most of the domestic agriculture land is occupied by animal feed. In addition, there are still around 700,000 tonnes of feed from abroad. All this must first grow on some soil. In order to be able to produce this imported feed in Switzerland, more than 100,000 ha of additional arable land would be needed (today Switzerland has about 250,000 ha of arable land). That is why Switzerland is directly linked to foreign countries through meat consumption. In addition to the renunciation from meat, one can, of course, on the basis of these facts, also consider whether an organization is providing sustainable development aid or trying to export our livestock to the near-sighted. Think about this before you support an organization next time! The mountain areas: Ideal region for the livestock industry? Nonsensical: Import food for Swiss meat, TV-Sendung Kassensturz from1.9.2009 at 21:06. A man plants trees in the Indian desert for years: Now there is a forest. This shows too: If you want, any pasture can be transformed and used better.